Taking popular heartburn drugs for prolonged periods has been linked to serious kidney problems, including kidney failure. The sudden onset of kidney problems often serves as a red flag for doctors to discontinue their patients’ use of so-called proton pump inhibitors (PPIs), which are sold under the brand names Prevacid, Prilosec, Nexium and Protonix, among others. 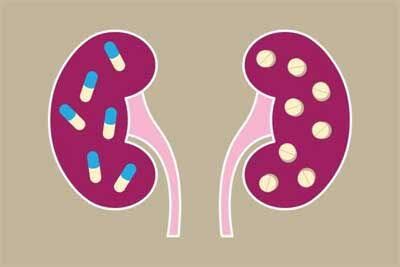 But a new study evaluating the use of PPIs in 125,000 patients indicates that more than half of patients who develop chronic kidney damage while taking the drugs don’t experience acute kidney problems beforehand, meaning patients may not be aware of a decline in kidney function, according to researchers at Washington University School of Medicine in St. Louis and the Veterans Affairs St. Louis Health Care System. Therefore, people who take PPIs, and their doctors, should be more vigilant in monitoring use of these medications. The researchers including first author Yan Xie, a biostatistician at the St. Louis VA analyzed data from the Department of Veterans Affairs databases on 125,596 new users of PPIs and 18,436 new users of other heartburn drugs referred to as H2 blockers. The latter are much less likely to cause kidney problems but often aren’t as effective. Suggest alternative when only treatment available for heart burn due to HIATUS HERNIA suffering from reflux acidity likely to cause osophegeal carcinoma & day to day life is miserable due to ACIDITY .